That Varanasi is a holy city for Hindus is a widely known fact. But it also has a large Muslim population is probably not as well known. The harmonious co-existence of people of both the faiths for centuries was largely responsible for the Ganga-Jamuni tehzeeb that has found expression in various forms including dance, music and even cuisine. 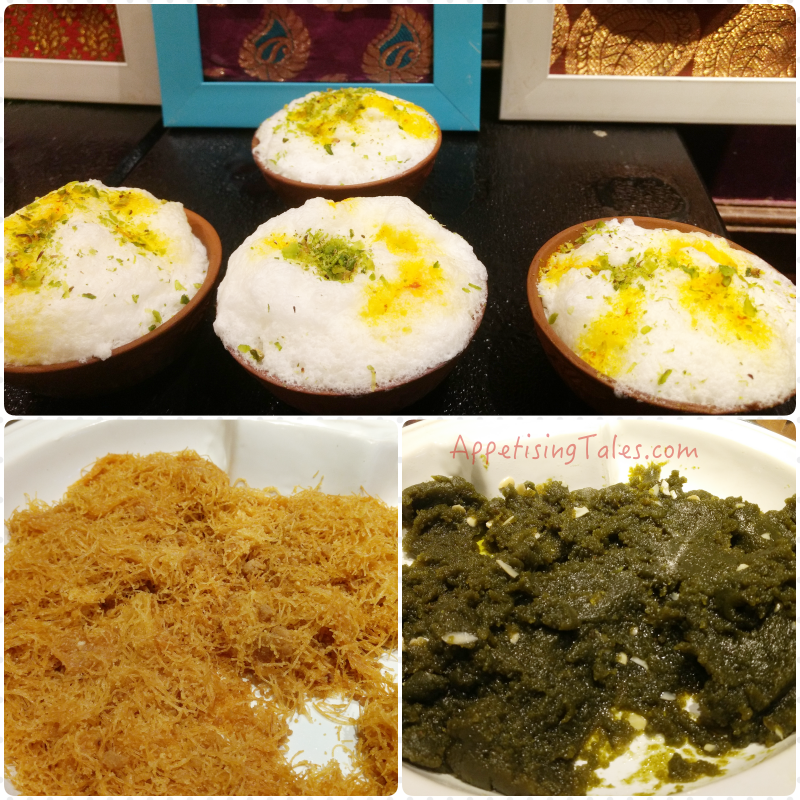 The ‘Simply Benaras’ food festival that concluded yesterday at The Pavilion, ITC Maurya gave a good taste of this unique amalgamation. L-R: Sangeeta Khanna, Chef Manisha Bhasin, Rana Safvi. ITC Hotels regularly host food festivals featuring regional cuisines of India under their brand Kitchens of India. 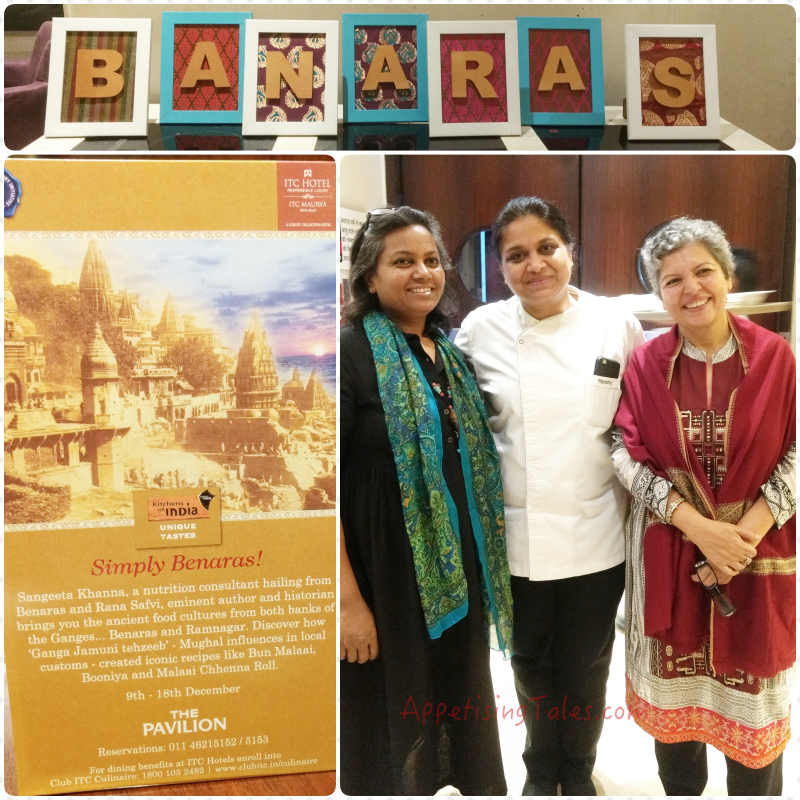 “Many people have served the cuisine of Benaras,” says Chef Manisha Bhasin, senior executive chef, ITC Maurya, “but we wanted to showcase the ancient food cultures from both banks of the Ganges – Benaras and Ramnagar.” The experts brought on board to curate this festival have contributed immensely on upholding traditions of the world’s oldest living city. Sangeeta Khanna, a nutrition consultant hailing from Benaras has been blogging about traditional recipes as well as their health benefits at BanarasKaKhaana.com. “Benaras has a strong philosophy of seasonal eating. There are many festivals centered around seasonal foods,” she shares. Rana Safvi, on the other hand, is a noted historian and author, whose maternal grandparents were from Ramnagar, the satellite town of Banaras. In fact, she hails from the family of the last Muslim dewan of a Brahmin king. 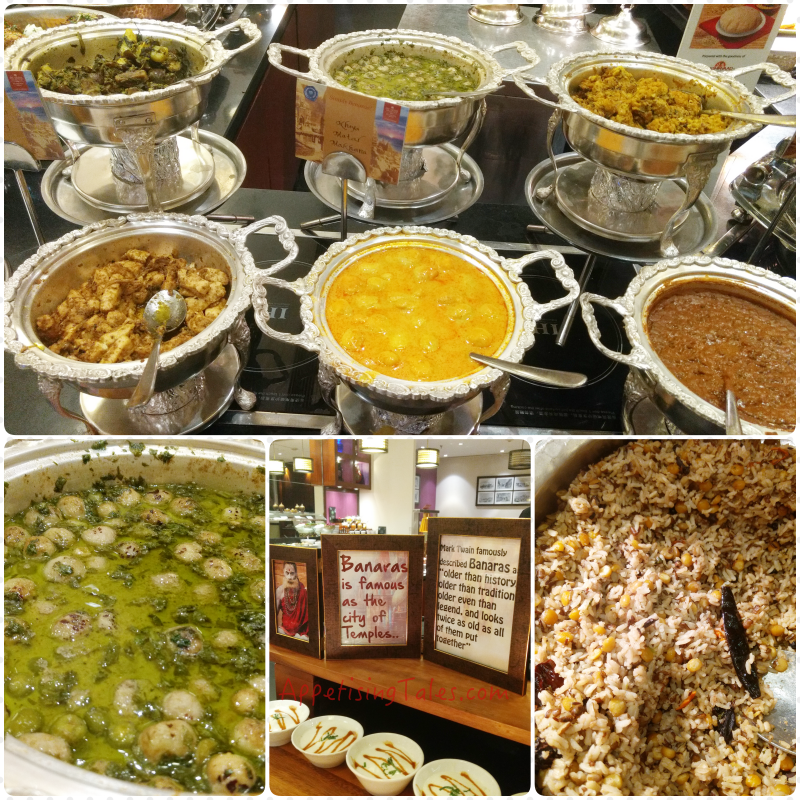 “Many people are not aware that Banaras has an extensive repertoire of Muslim cuisine,” she says. Both the ladies have treasure troves of stories and immense knowledge about Benaras. You can follow their blogs http://banaraskakhana.com and https://ranasafvi.com respectively to learn more about their subjects, stories and recipes. But stories and trivia aside, Khanna and Safvi brought forth their family recipes and cooked in the environs of this five-star hotel to jointly curate the ‘Simply Benaras’ festival. murgh korma, machhli dum and yakhni pulao. The latter being extremely aromatic and flavourful, Safvi explained that when rice is cooked along with the curry/soup it is known as pulao, whereas when cooked rice is layered with cooked meat it is called biryani. “Bira is a Persian word for fried onion,” she says, adding that most biryanis also have a layer of fried onion, hence the name. 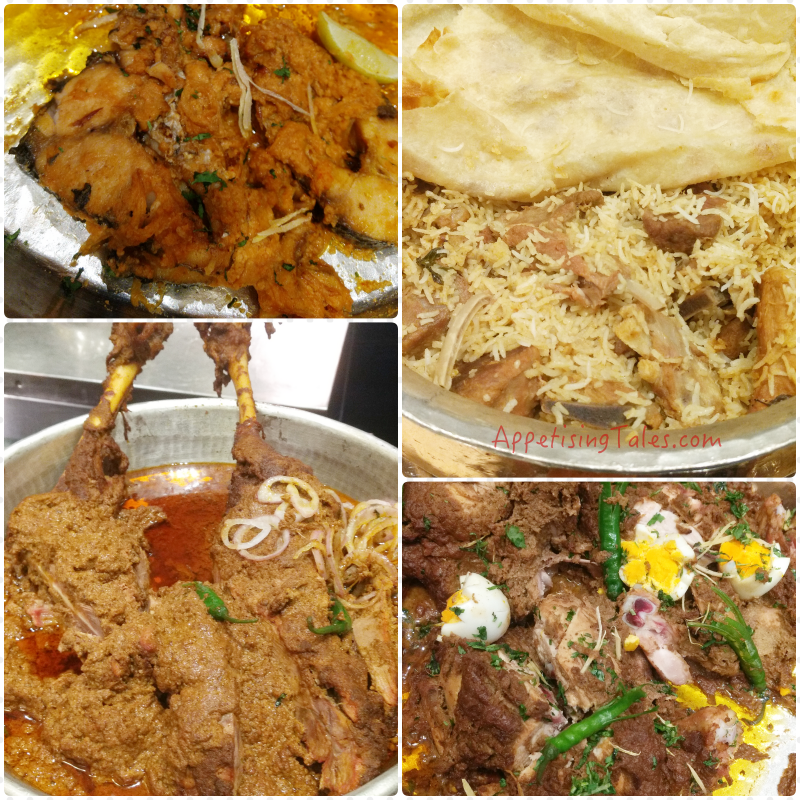 The other non-vegetarian dishes that were showcased during the festival include patta shaljam gosht ka salan (meat cooked with turnip and its leaves), qormas, khichda and dum ki bater (quail). Bottom: Khoya Matar Makhana; Urad Chane ki Khichdi. 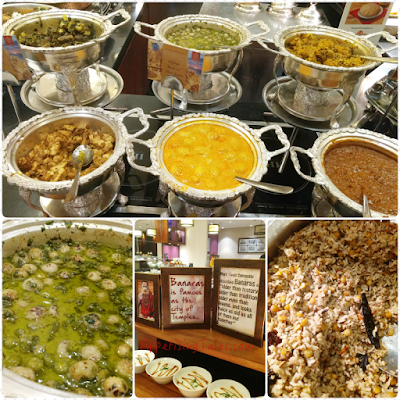 The vegetarian fare also included seasonal specials such as urad and chane ki dal ki khichdi and a soup called dal ki dulhan. “The yellow, liquidy khichdis are lighter and appropriate for summer, but the slow cooked urad and chane ki dal ki khichdi is more wholesome and usually cooked in winter. It is cooked on dum and is actually more like a pulao than a khichdi,” says Sangeeta. Dal ki dulhan is an interesting broth made with thin and soupy dal. The ‘dulhan’ is a hollow whole-wheat dumpling that looks like the veil of a bride. If the dumplings are stuffed with dal pithi the soup is called ‘dal ka dulha’. Then there’s the quintessential kadhi that is markedly different from the Punjabi or Sindhi kadhis – it is lighter and not as fiery. Matar ka nimona a traditional curry that is usually cooked in winter is simmered till green peas get a dal-like consistency and aromatic herbs and winter spices lend it quite a punch. My favourite however was the khoya matar makhana, another curry made with green peas and fox nuts. It is as comforting as it is novel. Bottom: Qiwam ki Sewaiyyan; Hare Chane ka Halwa. Finally, every region of India has its own special desserts and UP is no less. While people savoured the delicious qiwam ki sewaiyyan or hare chane ka halwa, what stood out for me was Maliyyo. A special from the streets of Benaras, this sweet made with churned milk is traditionally left out on rooftops allowing it to get mixed with the morning dew. Although it cannot be made strictly traditionally in Delhi, this light and airy dessert is definitely worth trying whenever you get an opportunity. And, of course, the meal was rounded up with Benarasi paan! Cuisine of a region is such a vast topic that it is impossible to cover it all within the scope of one article, especially when it hails from a vibrant and multi-cultural city like Benaras. But even if we were to scrape just the tip of the iceberg, Simply Benaras offered a delicious glimpse of it. This article first appeared on indiatoday.intoday.in on December 19, 2016. It has been modified by the author to fit the requirements of AppetisingTales.com.